STRUCTURAL PLASTICS Add-A-Level 2-5/8" Modular Work Platforms let you design hundreds of workstation configurations for machine areas, warehouses or large departments. High-density polyethylene construction. 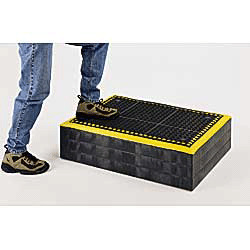 Modular platforms are chemical resistant and easy to move. 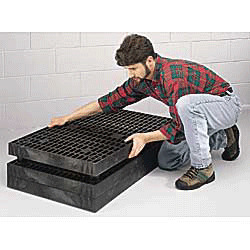 Top surface features a flow-through grid that allows liquids and small particles to drain away. Connection Clips lock units together horizontally in any configuration—in-line, around posts/machines, or over the entire floor. Stack additional platforms using patent pending Stackers. Stack as many as five platforms vertically to create stairs or work stations. NOTE: One base with two add-ons shown. 7/8" thick mat relieves tired back, feet and legs and promotes circulation. Anti-skid surface prevents accidents. Plug locks secure the mat to the top of platform. Available in solid black or Black with a yellow border (Pic. 2).